Express Talk is software that works like a telephone to let you make calls from your PC or Mac. With Express Talk you can call anyone on the internet who has installed Express Talk (or any other SIP voip softphone). Calls are free. You can also call ordinary telephone numbers anywhere in the world if you sign up to a gateway service. It uses the SIP protocol and is compatible with most major VoIP SIP service providers. See below for some recommended telephone gateway companies. Express Talk Business Edition has many practical features designed specifically for business users. These include call conferencing, the ability to transfer calls, call recording, push to talk intercom, do not disturb option, multiple line configurations and more advanced configuration options. You can download a free trial of Express Talk Business Edition here, or purchase online here. 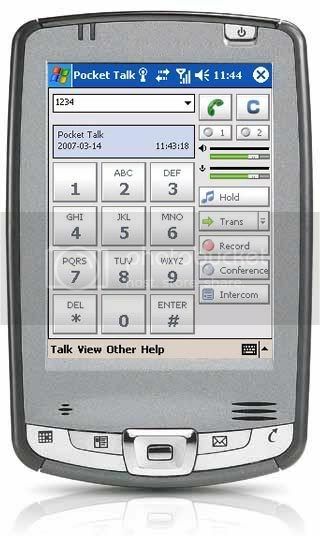 Express Talk is also now available for Pocket PC, so now you can take your VoIP numbers with you wherever you go. Great for people who work outside the office. If you are a business user looking for a complete telephone system for your office you may also want to try our VoIP Virtual PBx Software. Express Talk is designed to be very easy and intuitive to use. Within minutes you will be able to setup the software and start making phone calls. A full list of Express Talk’s features follow but a quick way to try it out is to download and install now. You don’t need to purchase and it only takes a couple of minutes to complete the process. Just click here to install for Windows or here for Mac OS X.